Crawl Me Blood is a sound and video installation produced by Aphids and designed by Halcyon Macleod and Willoh S. Weiland to take place in a botanic garden setting at night. 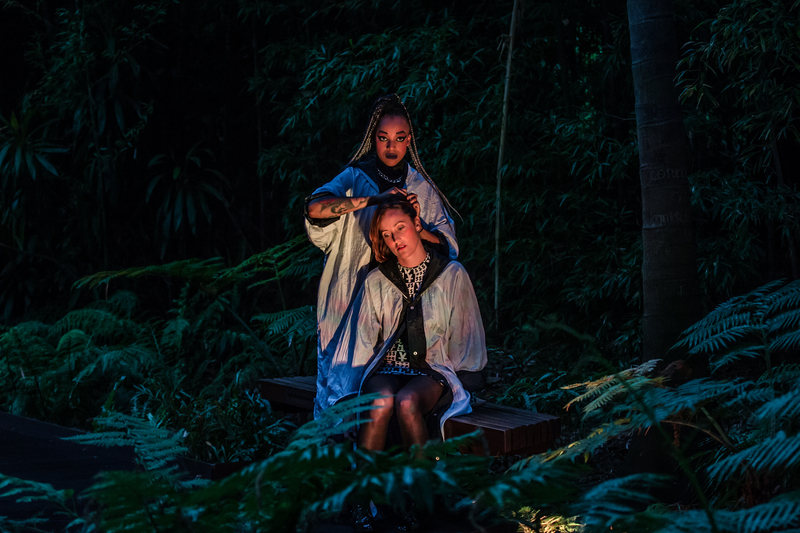 Aphids will bring this performance to the Royal Melbourne Botanic Gardens as part of the Melbourne Writers Festival for five shows from Wednesday 29th August until Saturday 1st September. The Melbourne iteration of Crawl Me Blood is presented in association with the Salamanca Arts Centre, Vitalstatistix and Performing Lines. The show debuted in April earlier this year at the Royal Tasmanian Botanic Gardens Hobart, Tasmania. Taking its inspiration from Wide Sargasso Sea – a work of modern fiction written by Caribbean author Jean Rhys – Crawl Me Blood is the result of a rigorous six-year process of research, writing and development. ‘Crawl me blood’ is a Caribbean phrase that means ‘the secrets that you sense but are not told’. This interpretation invites an Australian audience to unpack their own views on race and gender in the ferment of a post-colonial world. Crawl Me Blood has been co-created by Halcyon Macleod and Willoh S. Weiland with composer Felix Cross, performers Natasha Jynel, Zahra Newman, system designer Matt Daniels and video artist Lucy Benson. The team of Australian artists all have connections to the Caribbean region (Trinidad, Belize, Jamaica, Barbados) and their experiences contribute to the content of the radio drama. The work is bookended by two original video works to be viewed in an enclosed space such as a conservatory or greenhouse. These stunning and confronting video works speak to the core themes of race and gender in the work. It is scored by original music composed by Felix Cross and a collection of evocative contemporary and traditional music drawn from the Caribbean region including Dancehall, Ragga, Calypso and Soca.